You can reveal this card in your hand; your opponent randomly chooses 1 card from your entire hand, then you discard the chosen card. Then, if the discarded card was not “Danger! Nessie!”, Special Summon 1 “Danger! Nessie!” from your hand, and if you do, draw 1 card. If this card is discarded: You can add 1 “Danger!” card from your Deck to your hand, except “Danger! Nessie!” You can only use this effect of “Danger! Nessie!” once per turn. Finishing up the Danger! monsters the next two days, starting with Danger! Nessie! Same effects to get them to the field as all “Danger!” monsters, but Nessie has tremendous DEF where the others lacked that. If Special Summoned, Nessie will net you a card. If ditched, any “Danger!” card can be searched from the deck except itself. You would prefer your opponent call it wrong for Nessie, as a 3000DEF Level 8 that gets you a draw is likely better than just a search. You can Link and Xyz Summon with Nessie straight away, while only getting the search means likely another round of “pick the right card” from your hand. You have other “Danger!” monsters to search cards, you need that big body on the field. Bigfoot and Nessie get you big Rank 8 monsters. More than another reason to want them on the field. Happy Monday! I guess we’re finishing off the Danger! monsters today and tomorrow. Danger! Nessie! is a Level 7 Dark Aqua-type monster with 1600 Atk and 2800 Def. This is your defensive searcher meaning it does the whole reveal thing and then is either Special Summoned plus a draw or is discarded and searches a different Danger! card from the deck to your hand. Stats are largely meaningless except for the Def. This is your go to monster with Jackalope because of that particular stat. Otherwise you want to see this in your hand so you can get the search off the discard. Definitely worth running in 3, but I wish it was something like 2400 Atk and 2400 Def, but we can’t have everything. We will finish up the Danger! archetype to begin this week starting with Danger! Nessie! Nessie! is a Level 7 DARK Aqua with 1600 ATK and 2800 DEF. ATK is low on a Level 7, but DEF makes up for it. DARK is a great attribute and Aqua is an ok type. Nessie! has the standard Danger effect all the other monsters have to Special Summon themselves. If you discard Nessie! you can search for any Danger! monster from your deck excluding another Nessie!, this is a hard once per turn for Nessie! Well, every archetype has to have its own searcher and here it is for Danger! and of course it was going to be off the discard. Discarding this in the archetype should be easy with the other cards you are likely playing, meaning you shouldn’t have to worry about if you’ll be able to get the search or not. So far there are only three monsters in the archetype you can search for along with the Field Spell and Trap, but the best options for this might be Danger! Bigfoot! or Danger! Zone to either potentially get a 3000 ATK body on board or a spot removal or in the case of Danger! Zone a Graceful Charity like effect. Nessie! is going to be staple in the Danger! archetype no matter what the build is, your archetypal searcher is always important. Art: 4/5 Gotta have a sea monster in a cryptid archetype. Ahh, excellent, we get to open the week by finishing the Danger! theme, concluding with Nessie! Nessie is a Dark, Aqua Monster (a combination we don’t often see) who is Level 7 with a pathetic 1600 attack, but the beastly 2800 defense. Which pairs him well with Jackalope? as I referred to last week. So, reveal, opponent selects, you Special Summon Nessie if your opponent is wrong, discard if wrong…but you knew that from last week. You get to Draw a card, which again, should be recognized, comes with the Special Summon. Nessie! floats and adds a Danger! card from your Deck to your Hand (instead of the Field, again, referring to Jackalope?) but they can’t both do the same thing, right? That effect is granted to you if this card is discarded. You do want this thing in Defense though, that attack isn’t going to be winning you many Battles. 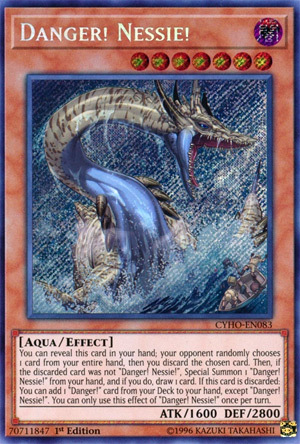 But your opponent should be using a Magic/Trap card or Monster effect to destroy Nessie! because you won’t see too many Monsters floating around to destroy that 2800 defense wall. It’s a bit more open in that way (Danger! card, not just Monster) than Jackalope? is but it’s all good. Run it for sure, at least in a pair. Next articleWickedly Cool Pokémon Swag Emerges from the Shadows!